The Fellowship was fortunate enough to obtain a copy of THE GREEN HORNET ’66 MEETS THE SPIRIT #1 from Dynamite Entertainment. The story is by Fred Van Lente, with art & colors by Bob Q, and letters by Travis Lanham. Daily Sentinel’s publisher Britt Reid is at the 1966 World’s Fair in Central City to unveil “The Electric Brain,” a machine that can predict future headlines. While taking questions from the audience to forecast dates of future events, a mysterious person races the stage asking the most unusual one…”Will Central City’s hero The Spirit ever return?” The beloved hero disappeared 14 years earlier while battling his arch nemesis The Octopus. The machine predicts that the hero will come back that evening! That evening Reid (and his sidekick Kato) returns to the machine as Green Hornet and encounters thugs trying to steal the machine. But that isn’t the end of the surprises…HAS he returned?? What a great start to what could be a fun series. Fred Van Lente captures the television series perfectly; it felt like an adaptation of an episode. Bob Q’s art is awesome; it fits flawlessly with the script. Also, nice Eisner ester egg or two in the issue (one hint: check out Colt Towers). Great book that everyone should check out. 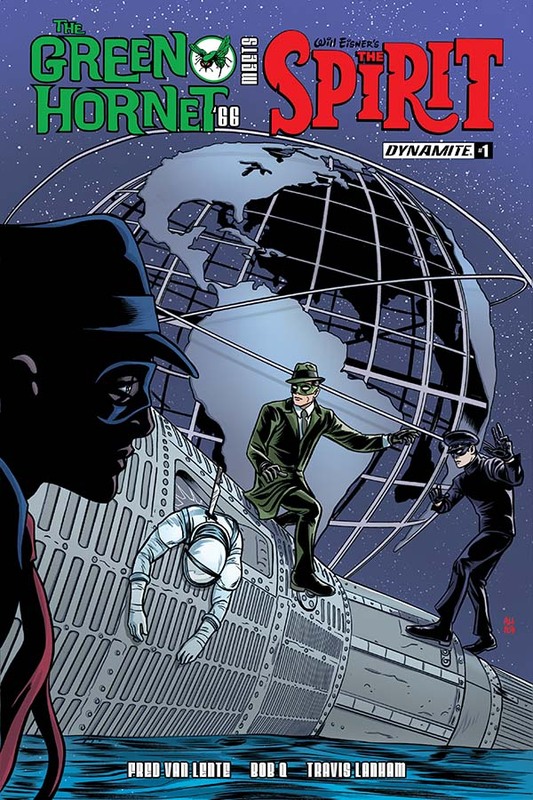 THE GREEN HORNET ’66 MEETS THE SPIRIT #1 is in stores now or available at www.dynamite.com.